An international symposium titled “Use of Standard Vocabularies in Art and History Areas – Getty Vocabulary Program Activities and Japan” took place at the National Museum of Japanese History on June 16th, 2018. Researcher Hideki KIKKAWA attended the symposium from the Department of Art Research, Archives and Information Systems so as to report on the progress of providing data on Japanese artist names to the Union List of Artist Names of the Getty Research Institute. You may not frequently hear the word “standard vocabularies,” which supports the informatization and distribution of personal and geographical names by standardizing their notation. For this symposium, planned by Dr. Makoto GOTO (Professor at the National Museum of Japanese History), Mr. Jonathan WARD (Senior Editor of the Getty Vocabulary Program) gave a lecture on the concept of Getty Vocabularies and their current utilization status, and Ms. Sophy Chen (Associate Researcher at the Institute of History and Philosophy, Academia Sinica) lectured about multilingualization of vocabularies. Following these lectures, researchers from Japanese related institutions also gave reports on personal name information, corporate area information, contemporary art information, and operation of Linked Open Data. During the panel discussion, contributions made by Japan to Getty Vocabularies were discussed. Additionally, on June 18th, 2018, Mr. Ward and persons in charge from the National Museum of Japanese History, the Nara National Research Institute for Cultural Properties, and the Tokyo National Museum were invited to this Institute to consult on how standard vocabularies associated with cultural properties should be in Japan. These opportunities allowed us to share the possibility of collaboration among the institutions creating standard vocabulary databases in Japan. Tokyo National Research Institute for Cultural Properties (TNRICP) drastically renewed the cultural property database in 2014 by using WordPress, a content management system. WordPress is an open source system used on a third of the websites in the world now. Its formal event, WordCamp, took place 128 times in 48 countries and regions in 2017 alone. 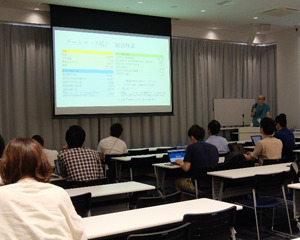 In the Word Camp Osaka 2018 (https://2018.osaka.wordcamp.org/) held in Osaka on June 2nd, 2018, three researchers: Tomohiro OYAMADA, Yoko FUTAGAMI, and Taiki MISHIMA gave a joint presentation titled “Make a cultural property information database using WordPress” so as to report on how to customize and operate using WordPress for the cultural property database. After the presentation, active information exchange was carried out based on lots of questions asked by people engaged in system operation at local governments and research institutions. Each of the operations required for TNRICP is unique. The information system which accumulates and transmits its achievements also requires uniqueness. We shall willingly release findings accumulated through the development and operation of the information system, in addition to our research outcomes. For the monthly seminar by the Department of Art Research, Archives and Information Systems held on June 26th, 2018, Senior Researcher Mayumi ONO delivered a presentation titled “Study of “Honcho Gaho Taiden” written by TOSA Mitsuoki – Getting “Gaguseihou Heisenhou Gokuhiden” as a Clue” with Ms. Miho SHIMOHARA (Kagoshima University) as commentator. 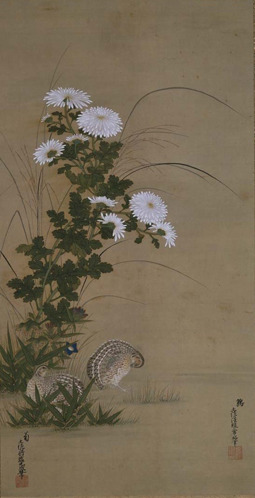 TOSA Mitsuoki (1634-1654) is a painter regarded as “a contributor to the revival of the Tosa family” since he reacquired the position of court painter (edokoro azukari) that had for many years been held by the Tosa family. Mitsuoki painted lots of new and elegant works by introducing Song and Yuan painting styles and sketches into the traditional Yamato-e painting. Honcho Gaho Taiden (possessed by Tokyo University of the Arts) is one of the books on brushwork written by Mitsuoki representing the early modern period. For this seminar, the coloring method mentioned in this book was compared to those referred to in the books on the art of painting at the Kano school: Honcho Gaden by KANO Einou and Gasen by HAYASI Moriatsu, and sketches by KANO Tsunenobu which are owned by the Tokyo National Museum. For example, as for the color called urumi, Mitsuoki wrote that “after applying cochineal red, indigo blue is attained.” However, the books on brushwork for the Kano school indicate another method under which whitewash is mixed. Accordingly, when referring to Tsunenobu’s sketches, urumi is mentioned as notes of Yamabato-zu (picture of turtledoves) and Kuzu-zu (picture of arrowroots). It turns out that actual colors unique to turtledove legs and arrowroot flowers are consistent with the coloring method Mitsuoki wrote about. These comparisons have clarified that the contents of Honcho Gaho Taiden are more practical and concrete than those of the other brushwork books. 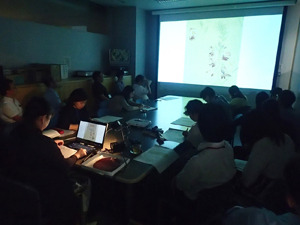 At the seminar, various comments were offered from the viewpoints of the Tosa, Sumiyoshi, and Kano schools, as well as research on Japanese-style painting. By further studying Mitsuoki’s book along with these researchers, the study of brushwork in the Edo period is expected to advance. 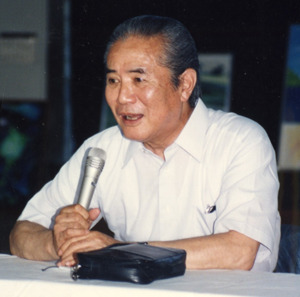 Mr. Tamon MIKI, who passed away in April 2018 at the age of 89, wrote as an aggressive critic in modern and contemporary art with focus on sculpture. After working for the National Museum of Modern Art, Tokyo, and the Cultural Properties Protection Department of the Agency for Cultural Affairs, he held directorial posts at the National Museum of Art, Osaka, the Tokushima Modern Art Museum, and the Tokyo Photographic Art Museum. 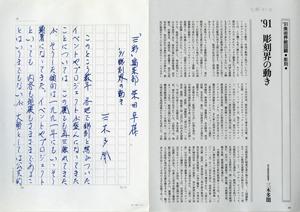 His bereaved family has indicated their intention to donate his manuscripts related to fine arts to the Institute through an intermediary, Ms. Eri NAKAYAMA working as a curator for the Koriyama City Museum of Art. The manuscripts include valuable materials regarding the postwar art trends, in addition to his achievements such as fine art articles written for newspapers and magazines, notebooks with records of his overseas visits in detail, and scrapbooks to organize handouts for exhibitions held at galleries. After they are filed at this institute, they will be accessible for browsing and utilization as research materials. 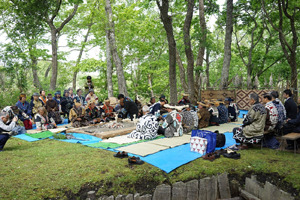 On June 17th, 2018, a traditional rite for Ainu people called icarpa was established out on the Ichani Karikariusu-iseki Ruins (nationally designated site) inside the Po-gawa River Historical Nature Park in Shibetsu Town, Hokkaido. Researchers of the Department of Intangible Cultural Heritage also visited the site. Shibetsu Icarpa is a memorial service for 23 Ainu people who were executed due to the Menashi-Kunashir rebellion in 1789, one of the resistance activities against the Wajin (the ethnic Japanese). The icarpa, organized by the Shibetsu municipal Ainu Association, was started in 2009, and it commemorated its tenth anniversary this year. For the first half of the rite, kamuinomi was established to offer sacred sake to the gods. For the last half of the rite, icarpa was conducted as a memorial service for the deceased. At the end of the rite, a song and a dance called upopo and rimse were performed. Shibetsu Icarpa was carried out at the Ichani Karikariusu-iseki Ruins, where a settlement had been formed most probably in the period when the Tobinitai culture had flourished from an archaeological perspective (circa 9th – 13th century). Together with Shibetsu Wetlands spreading in front of the site, it is now preserved in the Po-gawa River Historical Nature Park. Strictly speaking, the zenith of prosperity in the site is not consistent with the time when the rebellion occurred. Given that the site was run by their ancestors, it seems to have been chosen as a ritual place for reviving the traditional rite for Ainu people. 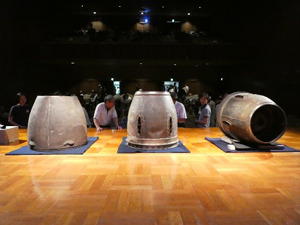 In recent years, following the requirement of utilization of cultural properties, the case of Shibetsu Icarpa may become one of the good models in the utilization of relics. This is because utilization is realized by making good use of an intangible element of the site or “cultural space” as the land of the ancestors. That is, the historical value of the site can be considered utilized as a cultural resource in today’s cultural renaissance for the Ainu. On the other hand, the value of the Ichani Karikariusu-iseki Ruins does not belong to Ainu people only. In time, with Shibetsu Icarpa, “Po-gawa River Festival” is held for local citizens by organizing a variety of events such as canoeing, historic spot guide touring by curators, and Jomon kids’ village. As part of the educational program, local school children continually participate in the icarpa in an attempt to understand the local culture. Although most of the residents in Shibetsu Town do not trace their roots to the Ainu, the site is utilized as a local cultural resource for these people too. At the same time, the site also serves as a place of interaction between people who have Ainu ancestry and non-Ainu ancestry. Recently, one city and four towns in Eastern Hokkaido including Shibetsu Town (Nemuro City, Betsukai Town, Shibetsu Town, Nakashibetsu Town and Rausu Town) have started an activity to jointly nominate the heritage of this area as Japan Heritage. The Ichani Karikariusu-iseki Ruins is positioned as its key component. In Hokkaido, a region where people with diverse roots live in harmony, how to honor its local heritage is a difficult issue. We will continually pay attention to the movements in Eastern Hokkaido including Shibetsu Town. 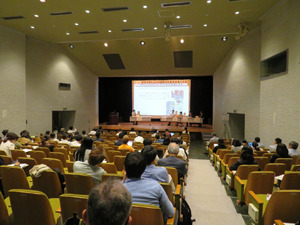 The Institute of Asian Cultural Studies and the Peace Research Institute of International Christian University, and Tokyo National Research Institute for Cultural Properties held a symposium titled “Towards a History of “HERE”: Learning from the Phantom Jet Engine” at the University on June 2nd, 2018. 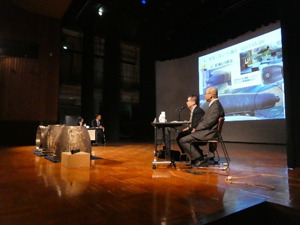 This symposium focused on looking back at the history of International Christian University (hereafter called “ICU”) founded on the premises of the research institute of the Nakajima Aircraft Company, which developed three jet engine components discovered on the campus in 2015, while widely sharing their values as cultural properties. For the first half of the symposium, Mr. Masahisa TAKAYANAGI, a teacher at ICU High School, talked about how the components were discovered, and their significance. Then, Mr. Hiroyuki NAGASHIMA, former visiting researcher at this Institute, introduced the outcomes of the survey on cultural properties conducted jointly by Tokyo National Research Institute for Cultural Properties and the Japan Aeronautic Association in 2017; and Mr. Shigeyoshi KANDA, a visiting researcher at this Institute, presented reference information contributing to their publication and utilization in the future. For the last half of the symposium, following the screening of a video work produced by students, Mr. Hikaru OKUIZUMI, a writer, Dr. Yoko KATO, a professor at the University of Tokyo, and Dr. Masakatsu OKADO, a professor at Yokohama National University, gave their perspectives from their own points of view in a bid to evoke speculation about the jet engines, and the histories of the Tama area and World War II. At the end of the symposium, a comprehensive discussion was created based on questions from the audience. ICU is expected to continually consider conservation and utilization approaches that are unique to education and research institutions by clarifying the histories of the university and the surrounding area and using cultural properties to convey their values to many people while reviewing the issues presented by them. 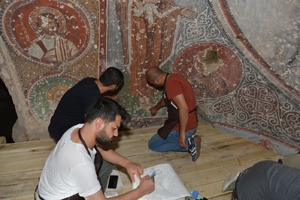 As part of the above-mentioned program commissioned by the Agency for Cultural Affairs, the training for “Examination and Implementation of Emergency Procedures for Wall Painting Conservation” was conducted at the St. Theodore (Tagar) Church in Cappadocia from June 25th to 28th, 2018. Similar to the previous year, this second training program attracted 30 conservators and restorers from 10 national conservation and restoration centers in the Republic of Turkey. This training aims to review the existing emergency procedures working as the linchpin to conserve mural paintings in Turkey, as well as to establish the protocol. For this training, the conservation status of the frescoes painted inside the rock-hewn church was carefully observed for recording, and the plaster with flaking risks was temporarily held on. On the last day of the training, the techniques and materials used as emergency measures were discussed with the trainees. As for the first seminar held in October 2017, introductory lectures on basic concepts in conservation and restoration of wall paintings were delivered. This practical training allowed the trainees to experience concrete intervention methods while contemplating which specific emergency measures would work under the framework of the previous seminar. The trainees commented that the objective of the training became clearer due to this on-site training. The next training will be conducted in October 2018. Aiming for the skill enhancement through the continued on-the-job training, the trainers and trainees will invest much effort into the establishment of the protocol for emergency procedures in Turkey. 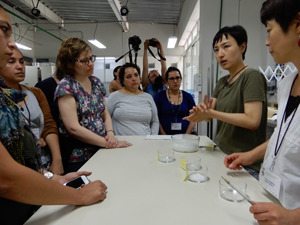 From May 28th to June 13th, 2018, the International Course on Paper Conservation in Latin America: Meeting with the East, was held as part of the LATAM program (conservation of cultural heritage in Latin America and the Caribbean). This course has been jointly organized by Tokyo National Research Institute for Cultural Properties (TNRICP), the International Centre for the Study of the Preservation and Restoration of Cultural Property (ICCROM), and the Instituto Nacional de Antropología e Historia (INAH). It has been held since 2012 at the Coordinacion Nacional de Conservacion del Patrimonio Cultural (CNCPC), which belongs to INAH, in Mexico City. This year, 11 conservation specialists from 8 countries (Argentina, Brazil, Colombia, Cuba, Mexico, Paraguay, Peru, and Spain) participated. 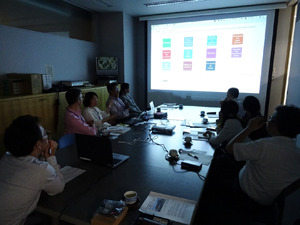 TNRICP hosted the first part of the course (May 29th to June 5th). TNRICP researchers and the instructor, who is from a certified group that holds the Selected Conservation Techniques dubbed “Restoration Techniques of Mounting,” offered practical works and lectures on the materials, tools, and techniques used for conservation. The objective of these sessions was to apply Japanese restoration techniques to cultural properties overseas. The practical session was carried out with CNCPC staff members, who learned “Restoration Techniques of Mounting” for several months at TNRICP. In the latter half of the course (June 6th to June 13th), specialists in the restoration of cultural properties from Mexico, Spain, and Argentina gave lectures. The main theme was the application of traditional handmade Japanese paper to Western conservation and restoration techniques. 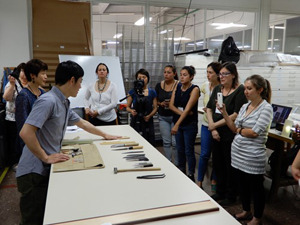 They spoke about how to select materials and apply their techniques to Western paper cultural properties. The lecturers had previously participated in international courses organized by TNRICP, and we were able to reaffirm that informational and practical exchanges through these courses contribute to the protection of cultural properties overseas. From June 24th through July 4th, 2018, the 42nd session of the World Heritage Committee was held in Manama, the capital of Bahrain. Staff members of this institute attended the session, and collected information on a variety of discussions over the World Heritage Convention. During the deliberation of inscription on the World Heritage List, the Committee often adopted decisions against recommendations by the Advisory Bodies as with the previous year. 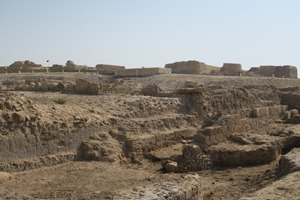 Among the nineteen sites inscribed on the World Heritage List, the Advisory Bodies had determined that seven sites were not sufficient as World Heritage Sites. This year in particular, some of the sites on which non-inscription had been recommended by the Advisory Bodies were decided to be inscribed on the List by the Committee. Several States Parties attending the session as observers criticized the attitude of the Committee members referring to it as disregard for expertise. The States Parties will also suffer adverse effects from ignoring recommendations from the Advisory Bodies. Forceful inscription will obscure the value of the sites, prevent establishing proper boundaries and eventually cause trouble in the conservation and management of the inscribed sites. In response to such unfavorable circumstances, the Advisory Bodies and the World Heritage Centre have made efforts to achieve mutual understanding and improvement in nomination details through dialogues with States Parties during the evaluation process. However, that has not achieved satisfactory outcomes so far. 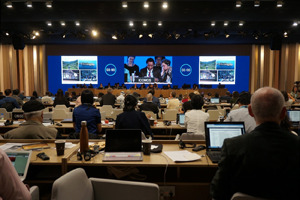 Under the circumstances, “Hidden Christian Sites in the Nagasaki Region” nominated by Japan, whose registration had been recommended by the Advisory Bodies, were unanimously decided to be inscribed on the List. Although their nomination dossier was submitted once in 2015, it was withdrawn considering the Advisory Bodies’ opinion, followed by its refinement over two years. As Japan realized this inscription with a huge amount of efforts through re-nomination, its sincere approach to implement the World Heritage Convention is highly esteemed.